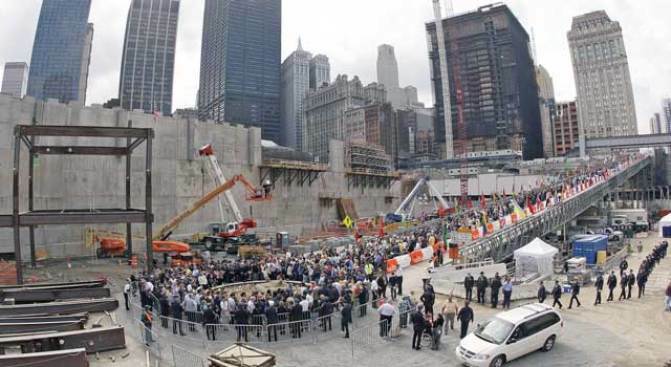 Study: Economic Impact of 9/11 Was "Short-Lived"
People gather at Ground Zero during a 9/11 memorial ceremony September 11, 2008 in New York City. The impact of the Sept. 11, 2001, terrorist attack on the U.S. economy was far less than original estimates, according to a report released Thursday. According to the study, researchers found that the impact of the terrorist attacks in New York and Washington, D.C., on the economy ranged from $35 billion to $109 billion for gross domestic product, or between 0.5 percent and 1 percent of the GDP. The report was released by the USC-based Center for Risk and Economic Analysis of Terrorism Events, which spearheaded the study. The estimate is far lower than previous estimates, which have ranged as high as $500 billion, or 5 percent of the annual GDP, according to the study, which is published in the journal Peace Economics, Peace Science, and Public Policy. Researchers said their findings highlight the resilience of the U.S. economy and provide a benchmark for measuring economic impacts of other events, ranging from natural disasters to the national mortgage banking crisis. "This is the most comprehensive study to date on the economic impacts of 9/11, and it can be applied towards future planning and preparation in the event of future terrorist attempts," said Adam Rose, a USC professor and coordinator for economics with the Center for Risk and Economic Analysis of Terrorism Events. "It shows that Osama bin Laden's policy strategy to damage the U.S. economy was short-lived in its effects due to the resiliency of the U.S. economy." The study, which includes eight individual research papers, determined that the "business interruption losses" from the attacks on the U.S. reached a high of $109 billion. The decline in Gross Regional Product for the New York Metropolitan area was just $14 billion, or 1.2 percent of the economy. For the World Trade Center, the total physical capital loss was estimated at $26.8 billion, while lifetime earnings loss was estimated at $9.7 billion and total stock loss was about $36.5 billion -- in 2006 dollars.